Australia's most famous maxi, Brindabella, won line honours in the 1997 Hobart and broke the record for a conventionally ballasted yacht (1d, 20h, 46m, 33s) in 1999, when she finished second on line to the water ballasted record breaker, Nokia. Designed by Scott Jutson,Brindabella, until August this year, held on to the Sydney Gold Coast Yacht Race record she broke 13 years ago - also in 1999. 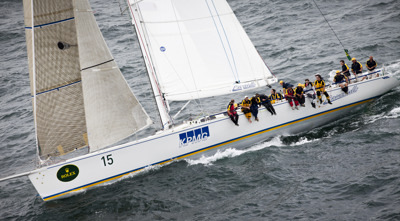 In 2010, Loki finally broke the Bird Island Race record Brindabella held for 15 years. In fact, the maxi held onto many of her east coast records for some time and still holds the record for Sydney Mooloolaba, Sydney Wollongong and Sydney Noumea Races. These races are no longer in existence, so unless they are reignited, those records will always belong to then owner, George Snow, and Brindabella. Under the ownership of Jim Cooney since 2010, had her Brindabella overhauled and refitted. If nothing else, this yacht has worn better than any other maxi yachts and still turns heads today with her sleek lines. She has a slick crew, including some Brindabella stalwarts who have stayed with the yacht for more than 10 years. Others include Brad Kellett, who takes pride in the yacht and provides the media with some of the best race reporting from the 628 nautical mile course each year. Cooney and his crew are happy to be back in this famous and tough race and will be doing their best to keep her at the front end of the fleet. Should it blow, and they get it right, Brindabella could come into her own.